Piano Hinges, despite being very “low-tech” can be complicated to understand. Armed with a little information, you too can become a hinge expert. Here’s a crash course on Continuous Hinge Terminology. Let us know via our Contact Form if you have any other questions. First, the basics. When ordering a continuous hinge, you need to know a few important details: Overall Width (aka OPEN Width), Length, Material type and Material Thickness. Once you know these dimensions, the rest is easy. Don’t know what you need? Not sure what the industry standard is? THAT’S OK. We can walk you through the process and figure it out together! Mill Finish – Straight from the factory, no finish. A residual oil may be present on the hinge, left from the manufacturing process (and to protect from corrosion). Our hinges are typically “2B” or “4B” mill finish. 4B is a brighter, more polished look right from the factory. Little or no polishing is required. If you plan to apply a finish of some kind, and don’t want to remove the residual machine oil left by the factory, request that your hinges be “cleaned” prior to shipping. This adds slightly to the cost, but can make your finishing process much easier. Powder Coated – For extra protection, and nice look. Typically available in White or Black. Continuous Hinges typically don’t come powder coated from the factory for several reasons: they can get scratched or scuffed during shipping or when installed. If you’re going to powder coat your enclosure, do it with the hinges installed, and powder coat them at the same time. Nonetheless, it’s an option. Anodizing – Aluminum hinges can be anodized. This is an electrochemical process where the hinge is electrically charged and dipped in a solution in order to apply a finish. Anodizing can produce a clear finish, white, black or just about any color in between. Electro Polished & Bright Annealed – Polished for that extra shine! Lacquered – Very similar to painting.. this process involved the application of a lacquer finish that provides a nice look and some additional corrosion protection. These Hinges have no holes. This allows you to drill your own pattern or welded to applications. 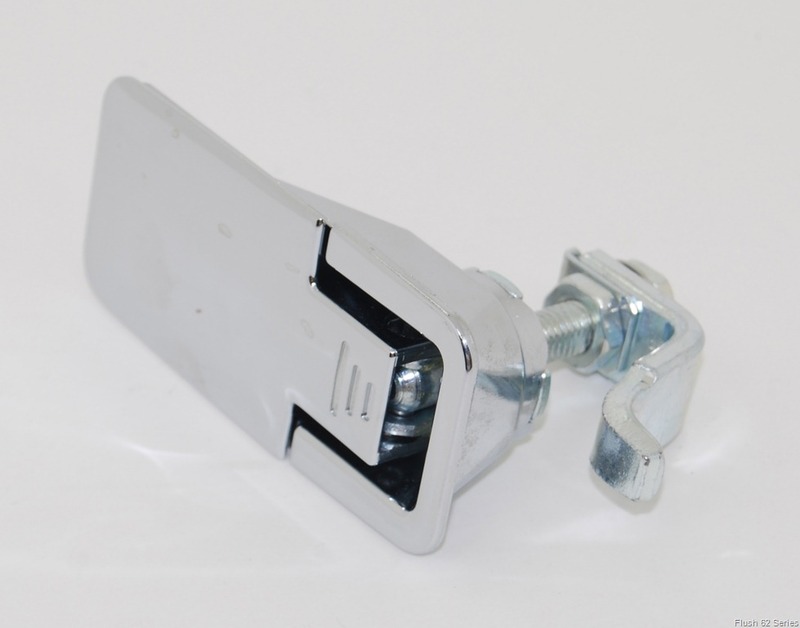 This is the most commonly used (and inexpensive) hinges we carry. These holes are punched and then countersunk, to ensure your mounting hardware will sit flush with the hinge. Holes on thicker material hinges are typically countersunk. This picture shows a hole pattern that is not staggered. Standard Punched Holes. These holes aren’t drilled, but punched. Special configurations are available, but typically require a minimum order quantity and have a long lead time. Need a special configuration quickly? We can achieve a “one leaf reverse swaged” by simply reverse-assembling the hinge. Easy! Most of our hinges come standard with “tight, staked pin”. However, if you plan to reverse-assemble your hinge, you’ll need to ask for “non-staked” or “loose pin”. Staking or tack-welding the pin in place (at one end only!) will be necessary in some applications. 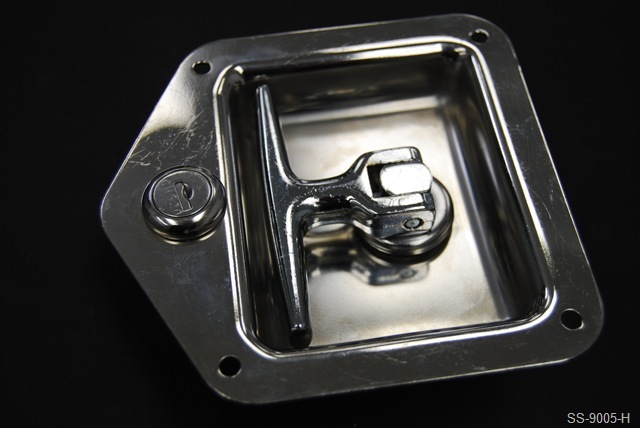 If you’re looking for a latch that is robust, corrosion resistant, and NON LOCKING, for an outdoor or marine application, this might be for you! 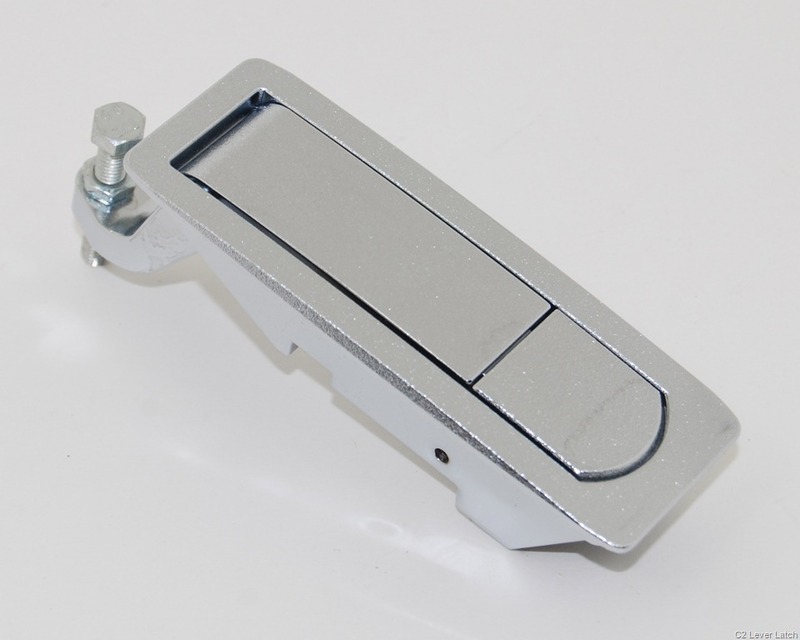 Click here for more detailed information on the TM Swing Latch. 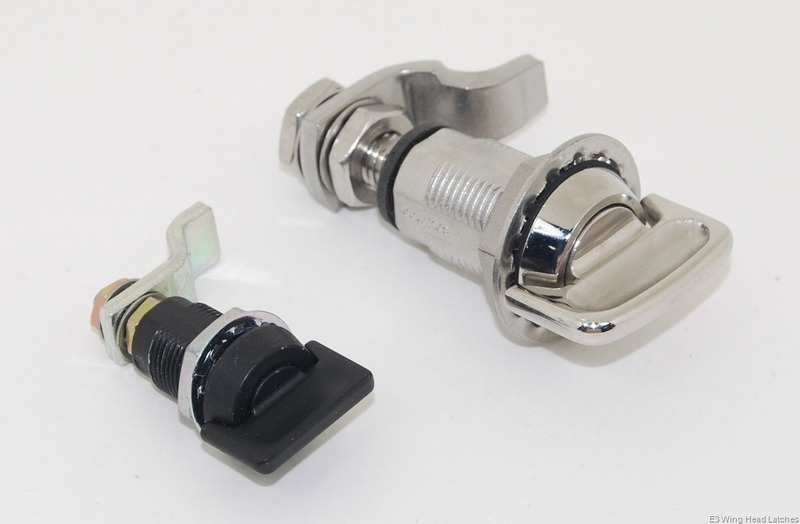 Here’s a quick glance at some of the Compression Latches we have to offer. Many of these are stocked items, or have a very short lead time! This is just a sample of the selection we have for you! As always, if you have any questions about our products, or if you need more information, please call us or use our Contact Form and we’d be happy to help you in any way we can. All of these latches provide a certain amount of compression when latched. 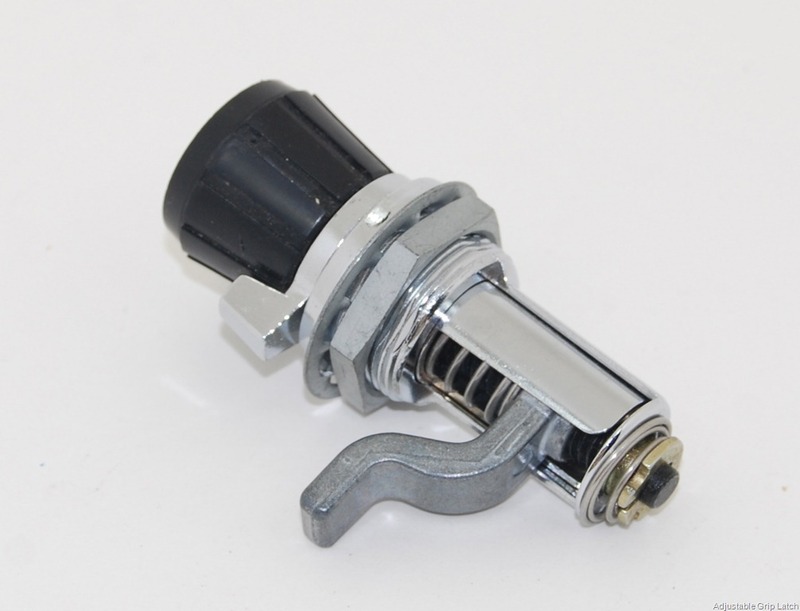 This is especially useful when your door is gasketed or when you need a certain amount of vibration resistance. If you don’t need to compress the door, check out our section on Pawl and Cam Action Latches instead. Southco’s flush lift and Turn Latch is a great option where smooth appearance and a low profile is needed. 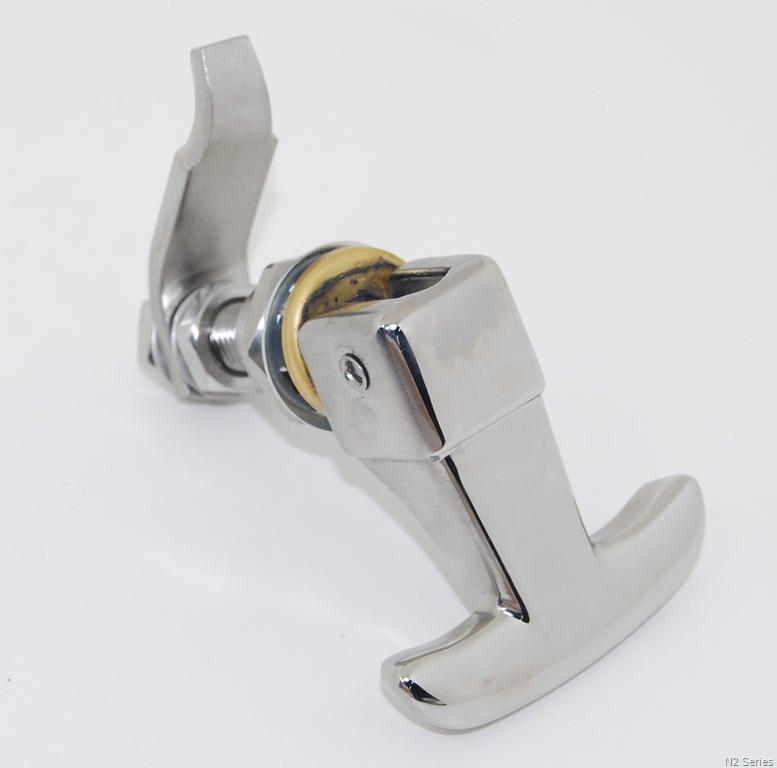 These provide adjustable compression, and are available polished Chrome, Textured Chrome, Black Powder Coat, locking and non-locking versions. 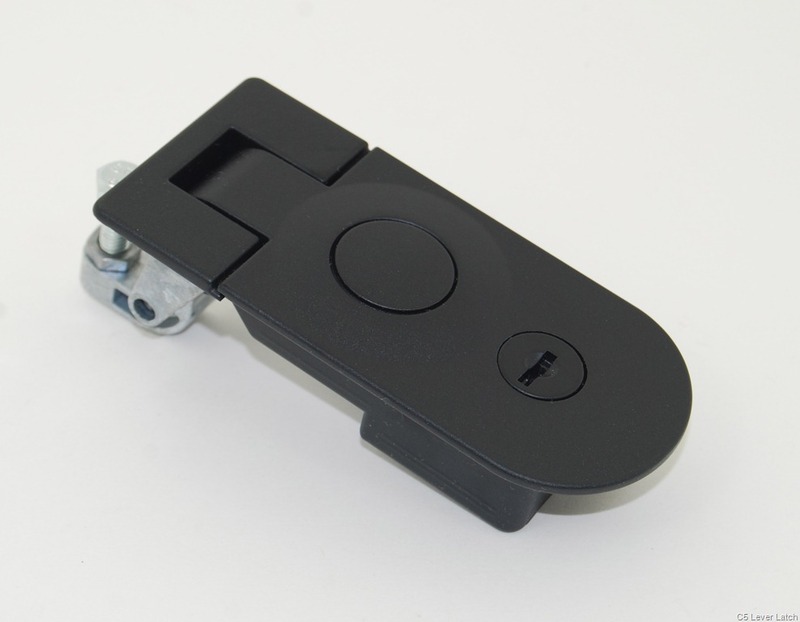 The Lift & Turn latch is simple to install, and easy to operate. The name says it all! Available in many sizes and finishes. The Adjustable Grip Latch adjusts itself every single time you use it, for the ideal fit each and every time. Available in many sizes, and head styles. 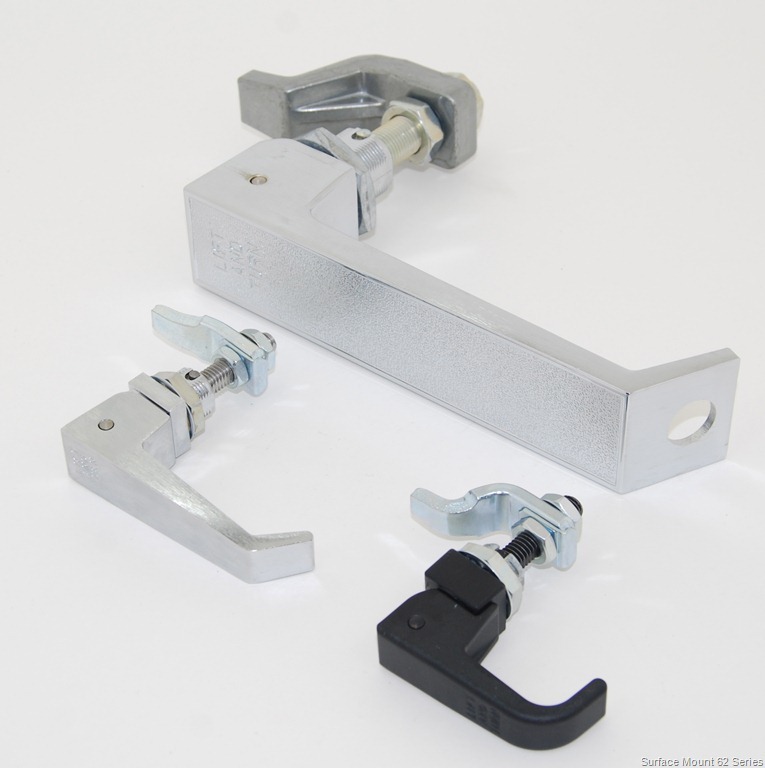 The Lever Latch is an economical, and easy solution for many applications- it’s not just a latch, it’s a handle too! Available in a wide range of finishes, locking and non-locking options too. The C5 Lever Latch is a heavier Lever Latch, but most notably, it’s NEMA rated for water resistance! Great for outdoor applications like hood latches on RV’s, access panels on boats, and much more. 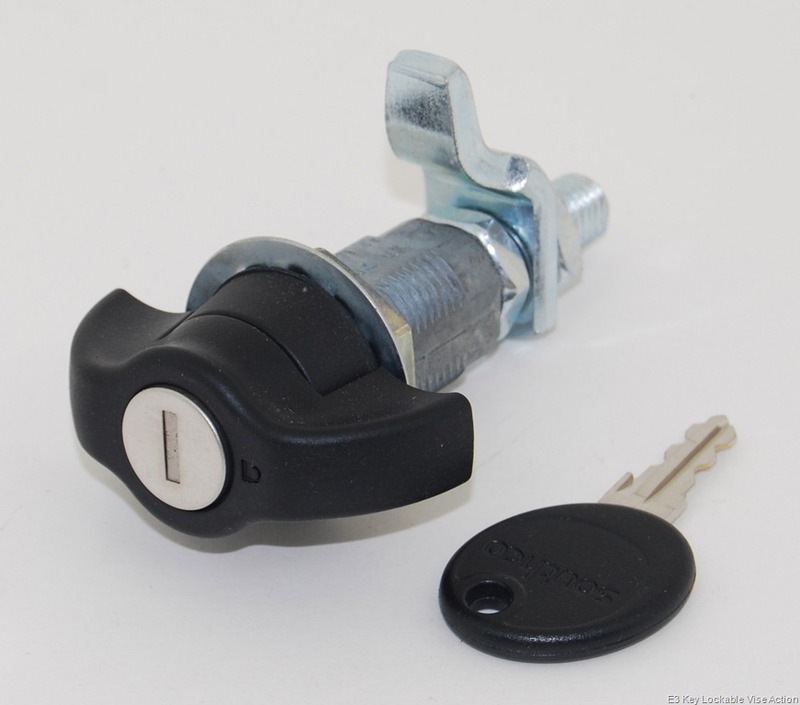 Southco now has a range of key-locking latches too! This is a vise-action compression latch with a key-lockable wing-head. Also available in many finishes, and can be adapted for a wide range of door and frame thicknesses. 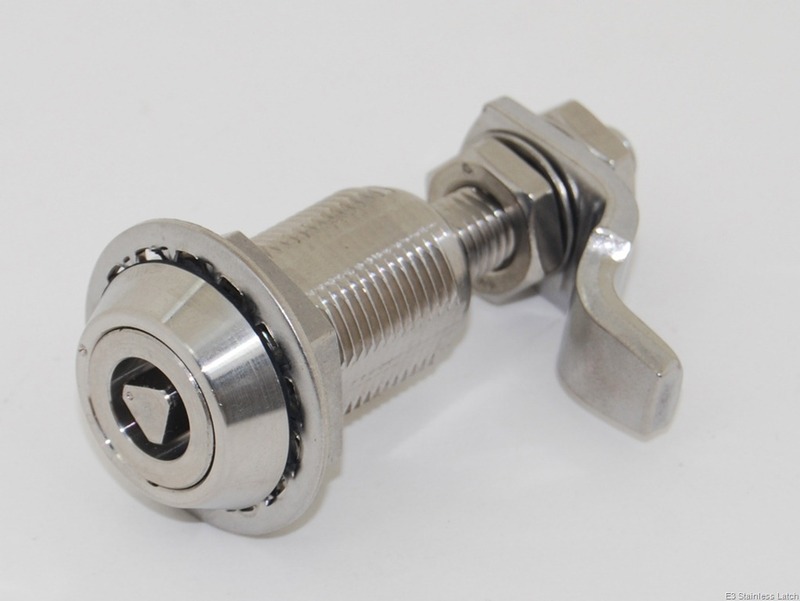 Need a Stainless Steel Latch? Look no further. Southco offers a range of Stainless hardware in a variety of head styles and body sizes. The N2 T-handle latch is a recent addition to Southco’s product lineup, designed to work in heavy-duty applications where visual appeal is still important. Available in a recessed version as well. Stainless and Steel versions are available too. Southco’s E3 vise-action latches have long been a favorite for their ease of installation, simple operation, and reliability. Available in a range of head styles and sizes. This Center Case is ideal for multi-point systems that require a polished (yet heavy duty) touch point. Whether it’s for your Suburban Commuter Bus or for a heavy duty toolbox, this latch provides a robust handle, stainless steel pan, optional key lock, and spring-return center-case action. Flip the handle up, turn it 90 degrees. Simple, easy actuation for remote rotary latches or slam bolts. Need to see one up close? Call us for more information, or use our contact form to reach us. We’re looking forward to meeting you! Adhesive Systems has the thread locking adhesives to increase the productivity and reliability of your assembly process. Threadlockers are single component, solvent free adhesives (anaerobics) that cure in the absence of air and in the presence of metal ions. Our Torque™ products and adhesives represent state of the art anaerobic technology, with world class performance. The thread locking sealants are manufactured to provide specific viscosities, strengths, and cure speeds to meet any application requirement. They distribute the load on a fastener over the entire engagement length of the assembly thereby greatly reducing or completely eliminating fastener and material fatigue. Our thread locking products work hard to lock and seal threaded fasteners for your assembly applications from delicate electronic devices and appliances to heavy industrial equipment. These anaerobic resins prevent loosening and shock from vibration, while locking and sealing threaded assemblies and metal parts. They prevent rust and corrosion that could jeopardize threaded areas. They have excellent resistance to extremely harsh environments; and they significantly reduce production costs. We offer Torque™ products that will lock and seal the smallest screws, as well as a thread locking compounds for all your bolts and other porous metal parts. Even for what seems to be the tightest fitting assembly, there are small voids which over time will cause the shifting and loosening of parts. For small metal screws in electronic devices and assorted appliances, our thread lockers can fill the smallest voids. For the larger metal threaded fasteners in large machinery and transportation equipment, high temperature thread locking sealants provide permanent thread locking with resistance to extremely high operating temperatures. This durability and versatility ensures our adhesives will meet your specific application requirements. I sell adhesives, but I’m amazed at the sheer number of applications that I find. Just recently, I was searching for a hollow wall anchor for a wall-climbing setup that a group of volunteers is building at Christ the King School. When I called my trusted source for anchors and fasteners, he recommended an epoxied-in threaded rod method. Hmm. It’s easy, very solid, doesn’t require high-tech or costly equipment, and just as important… it’s low cost. The idea is very simple: Drill a 5/8” hole that’s 1” deep into the masonry wall (avoid the grouted areas if possible). Make sure to remove all of the dust from your drilled hole using compressed air for best results. Fill the hole halfway with epoxy (we’d recommend Adhesive Systems MP 5405NS Maximum Performance 2 part epoxy), insert the threaded rod piece. In this case, we’re using 2 1/2” lengths of threaded rod, so that they’re flush with the 2×4 we’re attaching to the wall. Wiggle the threaded rod around in the epoxied hole to make sure that the epoxy fills up the threads, and evenly fills the hole. You’ll have to work fairly quickly, as this epoxy sets in only 3-5 minutes. Allow the epoxy to cure for about 30 minutes to ensure that it’s solid (though it only really takes 5-10 minutes).. and attach the panels to the wall. EASY! Still not convinced this is a good solution? We tested it! We took a cinder block, and drilled a 5/8” x 1” deep hole. Once the glue had cured for an hour, we subjected it to the most destructive of testing methods. We hit the exposed threaded rod with a hammer! Our intent was to see how many hits it would take to break either the bolt, the cinder block or the adhesive. This was a lot of fun, except that nothing broke! With at least 10 solid hits to the exposed threaded rod, all we managed to do was destroy the threads, and bend the 1/2” diameter threaded rod. The epoxy held firmly in place. Awesome stuff! Want to learn more about possible applications for your project? Use our Contact Form to reach us! We’re here to help! FSP Series Weld On Hinges are Steel hinges with a fixed steel pin installed. 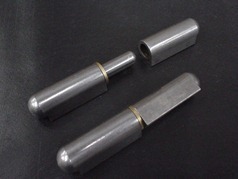 The come with a brass bushing to separate the two halves of the hinge for smooth operation. Weld On Hinges pack a lot of strength into a small package. Easy to install and even easier to use! Weld-On Hinges provide a low-profile hinge that can be installed in all kinds of situations for where you need easy access or a removable door. Do you use these hinges regularly? We would be happy to stock your specific hinges in Winnipeg, for quick, same-day shipment. Call us today at 1-800-318-1119 or use our Contact Form for pricing and lead time information! 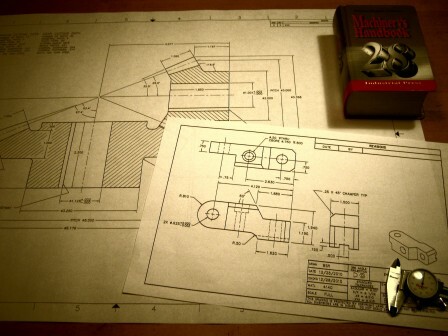 Yardley Products Has CAD Drawings! As an added convenience for our customers, dimension drawings for Yardley Product’s threaded inserts are now downloadable in CAD format. These drawings are available for download in a wide range of file formats to fit the specifications of the customer’s CAD system. Both 2D and 3D drawings are provided for each style of inserts. Engineers and designers will be able to download CAD drawings directly into their own CAD drawings on their desktop for a more accurate and integrated end design. Use our Contact Form to request a drawing today! OK, so we sell bolts, captive fasteners and specialty captive screws. Do we have the one you need, the one your customers need? Now you can find out! If, by chance we DON’T have what you need, it’s easy to add it to our “in-stock products” list. Just use our Contact Form to let us know what you’re using and how often you need them. We’ll take care of the rest! Download Your Clean Seal Catalog Today! Download your very own, printable-by-you Clean Seal Catalog today! Clean Seal’s extensive product line includes extruded rubber, grip seals, ultra grip, trim moldings and EPHA Hose Protection Systems parts. In addition, we have a variety of secondary operations to make the application of your part easier. Such examples of this are: die cutting, cutting and notching, cut to length and splicing (hot and cold). Use our Contact Form to ask for more information or samples!